The quandary of what to do with Thanksgiving leftovers is as old as the holiday itself. While sandwiches and soups will always be on the menu, a Chicago chef has come up with a recipe that saves time and refrigerator space. Janet Kirker of Foodease created a one-pan dish to satisfy overnight holiday guests as easily as possible. “Instead of having to pack the refrigerator full of leftovers and then find them all again the next day, just to heat them all up again, why not condense the work and the space all at once?” she says. The creation is appropriate for any meal, from morning to night. Line the inside of a 3-inch-by-5-inch loaf pan with plastic wrap, allowing several inches of overhang on each side. Firmly press about two thirds of the stuffing over the entire bottom of the pan and up the sides, ¼ inch thick. On top of the stuffing, arrange the slices of turkey side by side in a single layer in the bottom of the pan. Follow with a layer of mashed potatoes, about ½ inch thick, top with a layer of chopped bacon. Arrange the green beans side by side in a flat layer on top of the bacon. Top with the sliced sweet potatoes, pushing them together to form a smooth and even top layer. Finish the terrine with a final layer of stuffing, pressing it together firmly at the edges to seal in all of the goodies. Pull the overhanging plastic wrap over the top to cover completely. Press the terrine gently and evenly so that it is solid enough to stay together when it is sliced. When ready to serve, preheat the oven to 350°, and lightly grease a baking sheet with oil or nonstick spray. 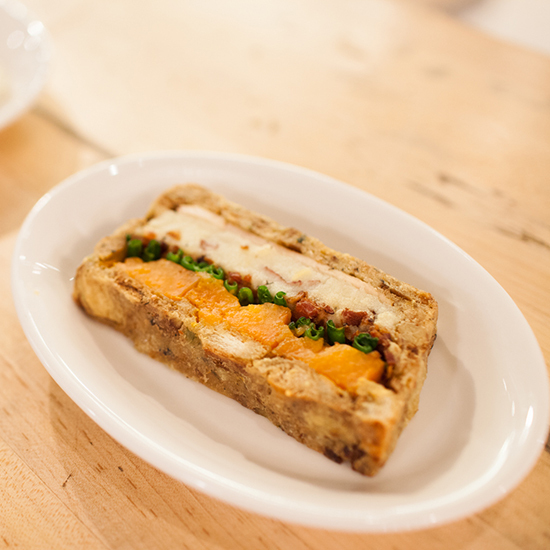 Slice the terrine into 1-inch thick slices and arrange carefully on the prepared baking sheet. Bake for 7 to 10 minutes or until hot and golden brown on the edges. Transfer each slice to a plate and, if desired, top with an egg cooked the way you love it. Serve with cranberry sauce and warm leftover gravy.